(October 28, 2012) Tanger Outlet management staff working on the development of their new mall in Steele Creek are confident that they will have sufficient space leased in the mall to break ground in spring or early summer 2013. Tanger is developing the project in conjunction with Childress Klein Properties and the current land owner, Steele Creek Limited Partnership. A major owner of land in Steele Creek, Steele Creek Limited Partnership was created by Charlotte civic leader Sarah Belk Gambrell. Childress-Klein and Mrs. Gambrell will be developing ancillary uses surrounding the outlet center. Tanger Outlet and Childress-Klein staff invited Charlotte City Council Member LaWana Mayfield and Steele Creek community representatives to tour the Tanger Outlet mall in Mebane last week. 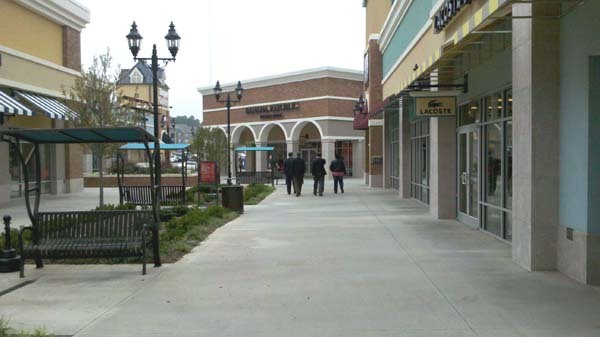 The Tanger Outlet mall in Mebane is about two years old and located about 30 miles east of Greensboro. The center in Steele creek will be slightly larger than the one in Mebane and will feature over 90 popular designer and brand name stores. Much of the merchandise will be last-year's styles or specially made for outlet stores so that it can be sold at reduced prices. The mall will have a racetrack style layout, with an interior loop similar to Concord Mills, but it will be about one fourth the size of Concord Mills. 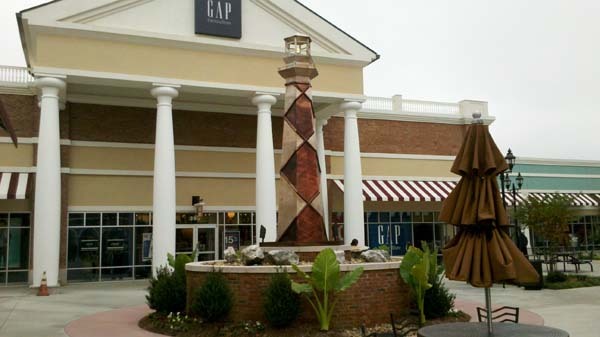 While Tanger Outlet malls across the country have a similar style, each has a distinctive look, typically based on a theme representative of the local area. 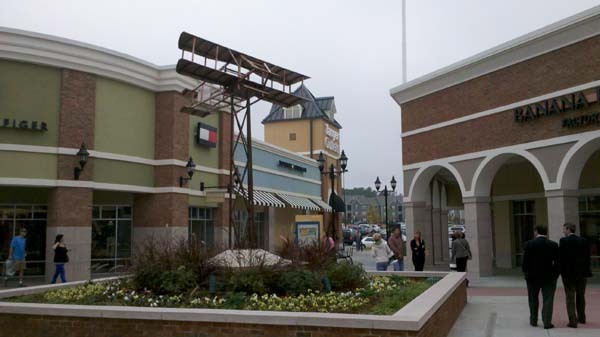 Although the mall in Mebane is quite inland, it features artistic reproductions of the Cape Lookout Lighthouse and a Wright Brothers glider, two symbols of coastal North Carolina. Tanger Outlet staff said that the Steele Creek mall will have a signature feature that will "pop." The theme and type of feature has not been selected, but it should be representative of Steele Creek and Charlotte. The site was rezoned in 2011 to allow a mixture of office, retail, and industrial flex uses. (See Petition 2011-011.) The change in use, plus the addition of several small parcels to the project, will require additional rezoning. The center will be at the northern end of the property, near Shopton road (formerly Dixie River Road) next to I-485. It will be visible to southbound I-485 traffic before the Steele Creek Road exit. About five nationally-known sit-down restaurants will be built along the new Dixie River Road, which will be widened to four lanes. The parking lot will sit between the restaurants and the mall. the mall in Mebane does not have a food court but does have a few small food outlets. The southern end of the property at Steele Creek Road will have a hotel, restaurant, and other retail and office uses. The whole project includes about $110,000,000 in new development. It will require 6 to 7 million dollars worth of road work, including the extension of Berewick Commons Parkway to the new Dixie River Road and traffic signals and additional lanes at both I-485 exit ramps on Steele Creek Road. The developers will pay for the road work with some reimbursement from public funds through tax increment financing (TIF). Although the mall will generate additional traffic, it is comparable to what would have been expected with the current approved uses. Completion of the initial 350,000 square-foot mall is expected in 2014, but the site has room for a 50,000 square foot mall expansion. This project also will require rezoning of a small site along I-485 north of Arrowood Road to allow construction of a billboard. Without this billboard, northbound traffic would not be aware that they would need to take the next exit to go to the outlet mall. Without the billboard, the project will not be built. The mall will be conveniently located between I-85 and I-77 for tourists. It will generate over 900 jobs in addition to several hundred temporary construction jobs. The outlet mall is not expected to compete with the Berewick Town Center across Dixie River Road. the outlet mall should stimulate construction of the Town Center soon. Tanger Outlets is active in outreach programs in the communities where their malls are located. One of their focuses is on breast cancer. Tanger Outlets will purchase the mall site, build the mall, and manage the mall. Having a single company building and operating the mall will allow for consistent, long-term investment in the community. The mall in Mebane is attractive, clean, and well maintained. No less is expected for the Steele Creek Mall. The entire property to be developed by Tanger Malls and Childress-Klein will have a master pan that will optimize traffic flow and ensure compatible design and uses throughout the site. All parties involved have expressed a strong desire to create a product that will enhance Steele Creek and be an asset to the community.